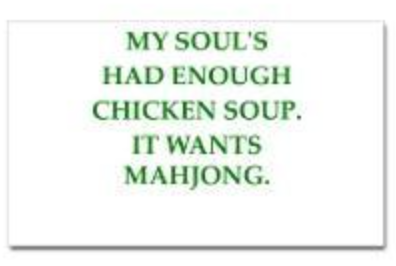 This entry was posted in Mah Jongg and Me and tagged chicken soup, mah jong, mah jongg, mahjong on September 14, 2015 by Mah Jongg and Me. I agree !! So, Ann, is that the title if your new book??? Mah Jongg for the Soul?? Pretty catchy title, don’t you think? ?